Unloved machinery working in harsh conditions can fail much sooner than it should, resulting in increased downtime and higher maintenance costs. CPM will provide your first condition monitoring session free of charge to allow you to see which motors, gearboxes and pumps need the most care and attention to keep running, and which will continue to run for the foreseeable without any problems. We already undertake monthly condition monitoring for some of the region’s largest producers of raw materials, manufacturers, and health care organisations to make sure their critical equipment is working when they need it most without it costing the earth. Motors and pumps operating in aggressive environments such as pulp and paper processing can fail without any warning, and can mean production grinds to a halt without any signs of impending failure ever visible to the naked eye. Condition monitoring allows you to see inside your machine and identify which of your motors or gearboxes require overhaul before they fail. Using an Emerson CSI 2130 vibration analyser, Flir E2 thermacam, spectrographic oil analysis and UE Systems 9000 series ultrasonic inspection device, combined with the latest techniques and several decades of experience CPM can pin point problems before they arise. 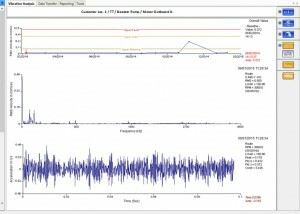 Vibration Analysis – Referenced against BS ISO 10816-5:2001 for vibration in rotating plant, existing data for the unit, and assessed using decades of experience and knowledge. Thermal Imaging – Identifies hotspots in electrical control panels, over heating bearings, failing insulation, and poor cable terminations revealed by excessive heat production. Thermographic image showing elevated temperature. This prompted an inspection of the motor cooling system which was shown to be underperforming, once the system was cleaned the motor returned to operating at normal temperatures. Oil Analysis – The quantity, size and composition of particles in the oil, water content and viscosity are measured. This information is extremely useful and trend data can be developed specific to each unit. It is sometimes even possible to identify which gear wheel or pinion is wearing from the type of particulate in the sample, however this is only possible if the materials used in each stage of a gearbox are known. Ultrasonic testing– Ultra sonic testing can be used to detect hairline fractures in gear casings, output shafts and welds. Working on a Sunday or through the night we can develop a condition monitoring regime to suit you, an initial inspection can be used to benchmark equipment, and with monthly visits this data can be used to develop accurate forecasts for ongoing maintenance costs and repair requirements. Once we have identified a scope of work and order of priority we will take the data harvested from your machines and translate it into an easy to read traffic light system, supported by a suggested action plan to address any issues in order of severity. With a 24hr repair service we can ensure you get the fastest possible turnaround on repairs, reducing downtime and increasing the performance and life span of your equipment. With no drop in efficiency and even possible gains in a motor which has been rewound, there are many benefits to be had from condition monitoring led predictive maintenance. The cost of a pre-failure repair and the cost of a post-failure repair differ greatly, post failure repairs tend to be more expensive, take longer, and with most failures occurring at peak load, usually happen at the most inconvenient time possible, potentially shutting down production in the middle of your busiest period. With condition monitoring led predictive maintenance this can be avoided, motors, gearboxes or pumps can be scheduled for repair during quiet periods or during shut down, eliminating unplanned stoppages, reducing downtime and minimising repair costs. To book a free on-site condition monitoring survey, or to learn more about our condition monitoring services, get in touch with one of our team now on 0161 865 6161 or by email.